The LG Tone series is surprisingly popular. Having sold 10 million units by 2015, that number is sure to have grown significantly since then which means if you don’t already own a pair you’ve most likely at least seen one. 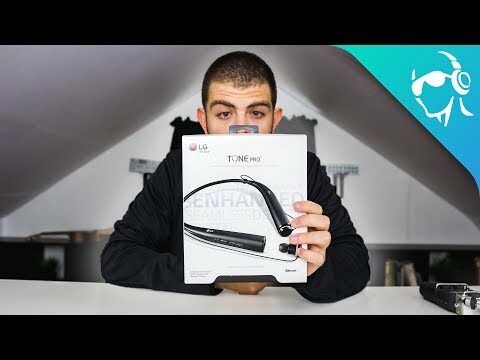 We decided to unbox and take a look at the new Tone Pro earbuds that came out earlier this year. Like most of the previous models they come with all of the components built into the neckband, but this one is super flexible and lightweight you won’t even notice it’s there. You’ll get Bluetooth 4.1 with aptX quality streaming on compatible devices and dual MEMS microphones for clearer phone calls. Sure these aren’t going to revolutionize anyone’s audio experience, but if you’re looking for a pair of wireless headphones to use on a commute these aren’t a bad option for the price. Enjoy a better sound experience on the go with the newly designed LG TONE PRO, featuring Advanced Quad Layer Speaker Technology for outstanding, balanced sound quality. Plus, with dual MEMS microphones it has never been easier to enjoy crisp and clear calls. As a premium Bluetooth wireless audio headset, the LG TONE PRO boasts smarter features and a sleek, hidden magnetic earbud design that gives this device a look that’s as impressive as its performance.